UltraBiotic Pregnancy Care is a specifically selected blend of evidence-based probiotics that supports the health of women during and after pregnancy. 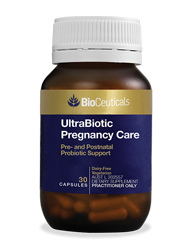 A multispecies probiotic blend to support women and their babies during and after pregnancy. UltraBiotic Pregnancy Care contains probiotic organisms that support the maintenance of a healthy maternal digestive, urogenital and immune system. Maternal intake of probiotics during pregnancy and breastfeeding may also influence infant growth patterns, microbiota development and decrease the incidence of mild atopic dermatitis/allergy symptoms in children in the first years of life. Seven probiotic strains and 35 billion CFU. In conjunction with dietary counselling, probiotics may help to maintain normal healthy glucose levels in women who have a normal blood glucose level during and after pregnancy. Maternal ingestion of probiotics may have a positive effect on infants’ health, such as decreasing the incidence of mild atopic dermatitis/allergy symptoms in children in their first years of life.